The pre-Startup safety audit is performed before the start-up of the Plant in oil and gas plant is conducted before gas/oil in. The PSSR is conducted for a new installation (green field project) or modified Installation/manufacturing (green Field project) to re-confirm that the installation is ready for start-up and hazard analysis performed. Erection of the equipment is in accordance with design. Equipment purchased as per the design. Safety, operating, maintenance, and emergency procedures are in place. A process hazard analysis has been made for new facilities and recommendations have been fulfilled before startup. Training of each employee involved in operating a process has been performed. A systematic and thorough check of a process prior to the introduction of a highly hazardous chemical to a process. 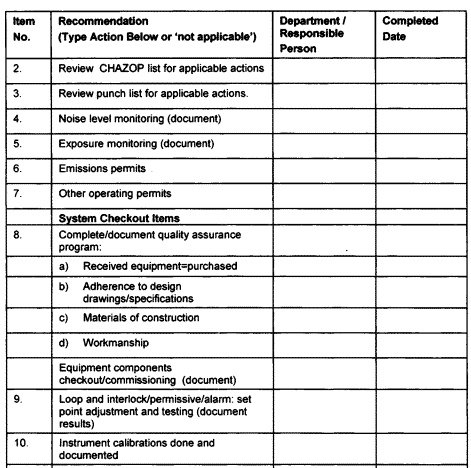 The PSSR must confirm the following: Construction and equipment are in accordance with design specifications; Safety, operating, maintenance, and emergency procedures are in place and are adequate; A process hazard analysis has been performed for new facilities and recommendations have been resolved or implemented before startup, and modified facilities meet the management of change requirements; and training of each employee involved in operating a process has been completed. Construction and equipment are in accordance with design specifications. Safety, operating, maintenance, and emergency procedures are in place and are adequate. A process hazard analysis has been performed for new facilities and recommendations have been resolved or implemented before startup, and modified facilities meet the management of change requirements. Training of each employee involved in operating a process has been completed. Engineers (Operation Engineer, Process Engineers and/or Reliability Specialists) knowledgeable in the process. Individuals familiar with the design and construction (Engineering / Construction Team). Operations reps – Facility Manager– Operators or Shift Engineers. Other personnel can be added based on the complexity and the size of the plant. PSSR Leader is accountable for organizing and keep a record of PSSR. Depending on the scope of the PSSR, 3rd party participants can be incorporated on the review team. These could include contractors that have right information or technical know-how associated with the equipment or process being reviewed. Process description and operating conditions. Engineering Flow Schemes or PFDs. Utility Flow Schemes or UFDs. Training, and documentation have been completed prior to startup and provided to PSSR team. Provide all the design specifications (Data sheet, Isometrics…) and a punch list of safety and administrative items which need to be completed before startup are provided to PSSR team. For changes involving the introduction of a highly hazardous chemical, ensure that all the information related to this chemical are provided to PSSR team. Area Classification drawings, Plot Plans. Please be aware that all this documentation shall be provided on the latest revision to the PSSR team. As soon as it has been determined that a PSSR is prerequisite to be completed, the suitable PSSR leader will gather a team to complete the review. The team must be composed of one or more persons with know-how and knowledge related to the issues involved in the change or new production unit. A PSSR checklist has been developed to help guide the discussions and focus the assessment effort on ensuring all process safety requirements have been performed so that the equipment can be considered safe to start. To support in carrying out the PSSR checks, the PSSR leader will need to ensure that the documentation for the changes/installation is readily accessible for the team. A meeting room review (OFF field Review) of the Changes/Project and the PSSR checklist in an effort to discuss the status of the checklist items not demanding a field visit (i.e. training, procedures, etc.) and to create a list of items for review in the field. A field visit by the PSSR team to confirm the status of items requiring a field visit as well as to validate the status of issues recognized during the OFF field review. The PSSR leader should lead the team in completing the PSSR checklist. For each portion of the checklist, the team must determine if the status of the item is adequate to allow the unit to start safely. All curative actions that are recognized as part of the PSSR process must be tracked. Priority on resolve of these corrective actions should be based on the residual risk associated with the items, with highest priority given to those items that must be finalized prior to start-up of the unit. Once the PSSR is complete and all corrective actions required for safe start up of the equipment is complete, the PSSR leader will seek out the necessary approvals of the PSSR. There are a number of approvals required prior to commissioning of new or modified assets. The final PSSR document for capital / Brown Field project must be kept with the project files for the asset. After all of the open action items relating to the pre-start-up safety review have been completed, the project manager is accountable for skimming the document into the project information file. The file should be stored in the project folder. For changes that are not being managed by the engineering group or for major pieces of equipment being returned to service after it has been mothballed or out of service for a prolonged period, the accomplished PSSR must be kept with the initiating MoC. PSSR checklist PDF is available online by wiley. Pre-Startup Safety Review_(237094616). – Suncor Energy Inc.